Who over the age of 35 doesn’t know that infamous line uttered by Clint Eastwood in Dirty Harry? What would you consider lucky? Nancy James feels lucky because she “fell into the film business over 30 years ago” after Steel Magnolias was filmed. Today, because of that lucky fall, she calls Eastwood friend. Yes, that Eastwood, the one who made his mark in Rawhide, carried a .44 magnum, hung ‘em high and went every which way but loose. 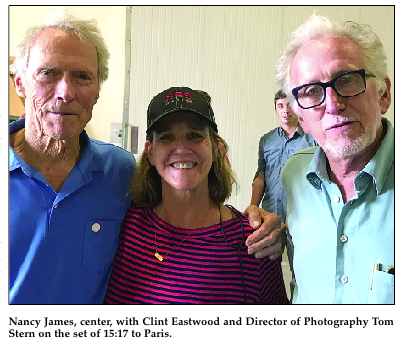 So how did a woman from Natchitoches Parish wind up hobnobbing with the likes of Eastwood? Let’s backpedal a bit. James doesn’t call it hobnobbing or rubbing elbows with the stars, she calls it a day at work. She runs her own craft services business on movie sets and says being starstruck went away pretty fast. “You’re there to do your job and they’re there to do theirs. They’re just people, I’m just a person and that’s all there is to it,” James said. So back to the juicy stuff – the celebrities. Does she know anyone besides Eastwood? Yes, and the list is long and impressive and if you don’t know James, you’d swear she was name dropping. Luckily Natchitoches knows James and knows that is not her at all. “I don’t want to leave anyone out or make them think I forgot them,” she says as she lists directors like Steven Spielberg, the Coen Brothers, Seth Rogan and actors like George Clooney, Brad Pitt, Matt Damon, Sandra Bullock, Robert Duvall, Robert Redford, Michelle Pfeiffer, Denzel Washington and Tom Hanks as people with whom she has worked, and gotten to know. Really? She actually does know them all. “Craft services is all about the morale of the crew. Producers worry about the crew so a good craft services person gets to know who they are tending to, the more personal the better. I need to know how this person likes their coffee and if this person likes sweet or unsweet tea and what brand of gum that person prefers. I take my job seriously and work really hard to be as good as I can personally be at it,” she said. It is also not always smooth sailing on movie sets. “Oh, we’ve had deluges come through when filming outside and everything gets ruined but they still want their coffee! There was even a hostage situation on one set and the production office was where SWAT came in to take the suspect down and as soon as it was over the director literally said ‘the show must go on’ and we went right back to work.” James said she actually made it into a movie once, albeit by accident. Eastwood called for her to bring him something to drink during filming when the cameras were rolling. Nancy James with Matt Damon. Part of her job is getting to know the cast and crew to better serve them. Her duties include stocking their trailers and having their requested snacks and drinks available.